It has been announced that Episode VII will occur approximately 30 years following Return of the Jedi, or around the 34 ABY date. This has several possible consequences. The most blatant is a complete reboot of all Expanded Universe material. This seems extreme, especially as certain EU properties are ongoing (The Old Republic) or are tie-ins to material that will explicitly be preserved (The Clone Wars tie-in novels and comics mostly). There are three other scenarios, of varying likelihood, all are based on the idea of ‘break points’ in the timeline, wherein everything after a certain date loses canonical validity. Such breaks could be hard, absolute directives based on date in-universe, or soft, with an assumption that material will stand until some explicit contradiction arises in the future EU. Regardless, it makes sense to look at these potential break points and what they would mean for the EU overall. Lucasfilm has long organized the EU into discrete ‘publishing eras’ of which there are seven plus the non-canon Infinities “era”. These eras are: Before the Republic, Old Republic, Rise of the Empire, Rebellion, New Republic, New Jedi Order, and Legacy. The dividing lines of these eras are, not coincidentally, where we find our break points. Scenario I: The End of the New Jedi Order (37 ABY): This break point would preserve everything but the Legacy Era and possibly the Dark Nest Trilogy. Scenario II: The End of the New Republic Era (25 ABY): This break point would preserve everything prior to the initial Yuuzhan Vong invasion, though a small number of works in the 19-25 ABY range would be called into question. Scenario III: The End of the Rebellion Era (5 ABY): This break point would preserve everything prior to Return of the Jedi. A small number of Rebellion Era works that occur post-Endor (Truce at Bakura, etc.) would be called into question. The question, to me, is not which break will be chosen, but what it would mean for the EU to choose each one. How much would be lost? While breaking continuity to any degree has a significant artistic cost in and of itself, in terms of the collective mass of accumulated material the answer is…different. The reason being EU materials are not distributed across the Eras with anything resembling equality. There is a curious question as to just how much of the EU is placed within any given era. To investigate this I decided to classify all EU works by Era, across all of the principle media: Adult Novels, Young Reader Novels, Short Stories, Comics, and Video Games. Note: this analysis considers only primary fictional works, not secondary analysis pieces like RPG supplements or Essential Guides. Though a significant portion of the EU’s cast of characters, technologies, and worlds originates in such material, they are not generally major sources of narrative and usually reach across vast regions of in-universe time. Additionally, most of this sort of secondary data is likely to be preserved regardless. Changes to the narrative are not going to write types of Blasters or one-shot smuggler encounters in the Outer Rim out of existence. Data for this analysis was taken, as usual, from Wookieepedia summaries (I dislike doing this but there is no other source that keeps up with the growth of the EU in real time). Obviously this sort of analysis presumes a certain degree of similarity between works. This is reasonable to some degree: most novels are roughly the same size, and the same is true for Young Reader works, Short Stories, and even Trade Paperbacks (the means used to classify comics). Similarity does break down in the realm of video games – comparing a fighting game like Masters of Teräs Käsi to a monumental MMO such as The Old Republic is rather ridiculous. Still, as the component of the EU with the broadest exposure by far, it would be foolish to ignore video games completely. When everything is summed up together it looks like this. This figure clearly displays the unequal distribution of the works across the eras. 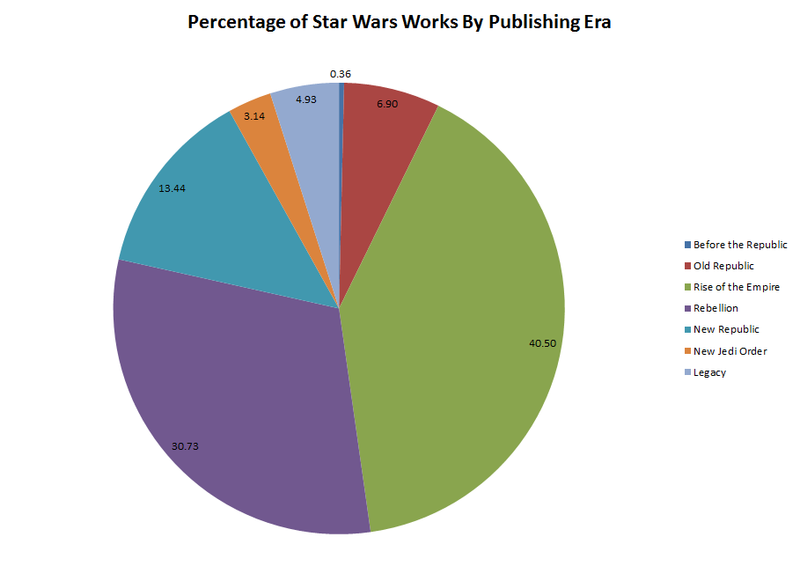 Out of six fully functional publishing eras – the Before the Republic Era consists entirely of Dawn of the Jedi products – the Rise of the Empire and Rebellion Eras are overwhelmingly dominant, consisting of 40.5 and 30.7 percent of canon respectively. Not coincidentally these are also the eras containing the entirety of the higher level Movie and TV canon. We can utilize this figure to take a look at the damage in the three scenarios presented above. Scenario I preserves 95.1% of canon. Scenario II preserves 91.9% of canon. Scenario III preserves 78.5% of canon. Somewhat to my surprise, over three-quarters of all EU material occurs prior to Return of the Jedi. This seems counter-intuitive. It is probably not consistent with the average EU fan’s impression that the New Jedi Order composes only 3.1% of all works, or the New Republic Era a mere 13.4%. This discontinuity can be illuminated by breaking the works down by their representative media types. This revealing figure shows that the distribution of works changes dramatically based on the type of production – which to some degree proxies the intended audience. The Rise of the Empire Era dominates all categories except Short Stories. The reason for this dominance can easily to be traced to the mammoth focus in Star Wars EU production on the Clone Wars following the release of the Prequel Trilogy. 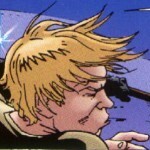 Short Stories display a Rebellion Era focus due to a generally earlier publication date – many were published in now defunct products such as Hyperspace.com or Star Wars Gamer well before the release of the Prequel Trilogy. There are other interesting pieces of data revealed by this graph. One is the pattern of certain types of publication completely ignoring certain eras. Young Readers stories are the most obvious – they have been published in only three eras, but Video Games also lack the New Jedi Order and Legacy Eras. The most illuminating aspect of this comparison is how different the Adult Novels category compares to that of all the others. The New Jedi Order comprises a mere 3.1% of all works but 14.2% of novels. Legacy likewise is 4.9% of all works but 14.8% of novels. This can be stated even more starkly in absolute terms: there are 45 Adult Novels published in the NJO and Legacy Eras. There are 45 works in all other media published in the same. Adult Novels comprise a mere 13.9% of all EU works (155 out of 1116), but 50% of the NJO and Legacy Eras. Additionally novels have an outsize presence in the New Republic Era, and a reduced presence in the Rebellion Era. While Young Reader works and Short Stories have mined the Original Trilogy extensively to produce numerous tales of the Rebellion, the novel line has been much more hesitant to do so. To put this at its starkest: if the entirety of the EU consisted of the novels, then losses to canon in the conditions presented above would be: I. Preserves 85.1% II. Preserves 71% III. Preserves 47.7%. 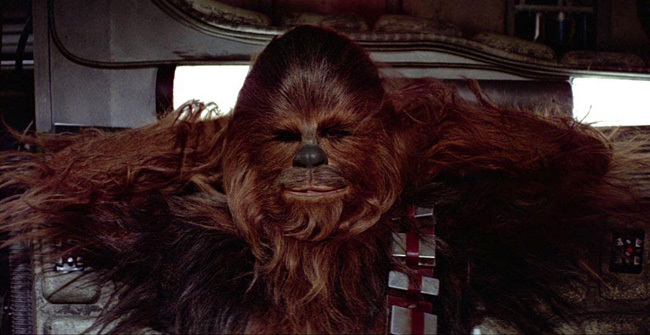 So, if you eliminate all novels after Return of the Jedi you’ve destroyed over half of them. If you do the same thing across all works you’ve destroyed only slightly above one-fifth (and further, because the largest individual sources of EU material are all video games set prior to ROTJ, this actually somewhat overstates the damage). The numbers, I suspect, conflict heavily with what most fans feel. This is unsurprising; very few, if any, Star Wars fans are total completists who have experienced everything in the EU. 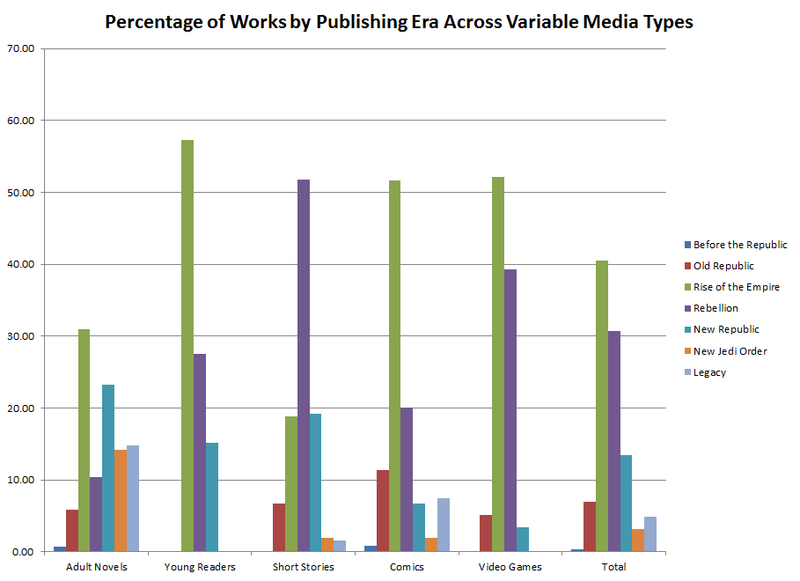 Exposure to Young Reader works is likely minimal among the average adult EU fan; many of the Short Stories are almost impossible to even find at present; while the Comics category includes many flagship titles it also includes a vast catalogue of shockingly obscure titles; and no one plays every type of video game. 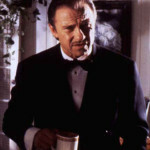 The novels have, for much of the EU’s existence, served to drive the plot. This is especially true of the New Republic, New Jedi Order, and Legacy Eras – the three eras currently in jeopardy. It is not unreasonable to view the current issues of canon as a battle between the storyline presented by the novels, and everything else. Despite this, my personal view is rather positive. In the scenario I consider most likely: a soft break point at Condition 2 – over 90% of the EU’s works will survive, at least initially, contact with the upcoming sequels. It could be a lot worse. I like this analysis. I feel a bit more upbeat about existing EU material now. Thanks! Well thought out, thanks for putting this into perspective! I know the ‘feelings’ are going to be the toughest part. As I doubt anyone else will say it: Excellent data presentation! Oh, I bet you say that to all the ladies. Don’t need to, not in the market. I personally hope for scenario 1, but would accept scenario 2 without too much disappointment. Scenario 3 is the only one that would utterly destroy my interest in the ST.
Once I would have agreed with you on wanting scenario 1, but as much as I loved the NJO arc I think it would be better if the break point was just before it. It’s not the kind of thing that can happen off-screen. To me, scenario 2 is the best option. And scenario 3 would just leave me very, very cranky (though I’d probably watch it anyway because I’m a tragic like that). I am sorry but your Statistics are very off. What about RPG material? it is missing. Also novels and media need to be weighed by the mass of content they contain, which would given the thickness of novels, rpg books etc. would certainly change your numbers dramatically. A short story of 2 pages can hardly be weighed the same as a novel of 300-400 pages contentwise. Thus a loss of one novel would be a higher loss than the loss of a short story if you see it weighed by content. Therefore your statistics point to nice directions but hardly scratch the core yet. As you said novels were the main course of story post ROTJ often and paired with accompanying RPG in the NR era especially, have a much higher percentage of lore lost, if you view it not by number/percentage of books/media but rather by the lore they contain (using averages for pagecount of a book vs. that of short stories and other media like games etc.). Also your statistics totally ignore guidebooks and the lore they added/expanded in the endangered eras. Please adapt your statistics accordingly so we can enjoy the full extent of their meaningful addition to the discussion at hand. Thank you! So, following the 4/25/2014 announcement, I must admit that my conclusions in this article were severely in error. Disney has chosen a soft break at scenario 3, immediately destroying over 20% of all canon. Further, they have chosen to prioritize the upcoming Rebels TV series over everything else, placing all material from both the Rise of the Empire and Rebellion Eras into jeopardy. At this point the only era that retains any sort of united single continuity status is the Old Republic era, and that only because TOR (apparently to be placed into the new continuity by virtue of its ongoing status) directs references almost all Old Repulic Era events that preceded it. Seven percent of the EU project remains. I should note here that because of this decision there is no longer any effective ‘Star Wars Universe’ to analyze collectively, so I will not be producing any additional Go Figure articles. Thanks to all who read them, hopefully they were useful while it lasted.